Greetings, Sea-folk! As promised In my last missive, I will be posting pages as I get them done. You may remember that this was due to a crazy-busy convention season; well, a funny thing happened on the way to the second and third cons: I caught the nastiest “cold” (that word seems like the understatement of the century) I’ve had in many a year and had to cancel my whole trip, which disappointed me deeply. I was too sick even to draw comics (which I had planned to do on my trip), so I’ve only started back to work, slowly, over the last week. I decided to take my time on this double-page spread and really enjoy it as therapy, which I did. It’s a good way to work, slowly and carefully and thoughtfully; I often don’t have time to do that with deadlines looming. So I hope you enjoy this page, and this mysterious dream that Sami is having! I’ll continue posting pages as I get them done, as I am still recovering and need to take things lightly for a bit. 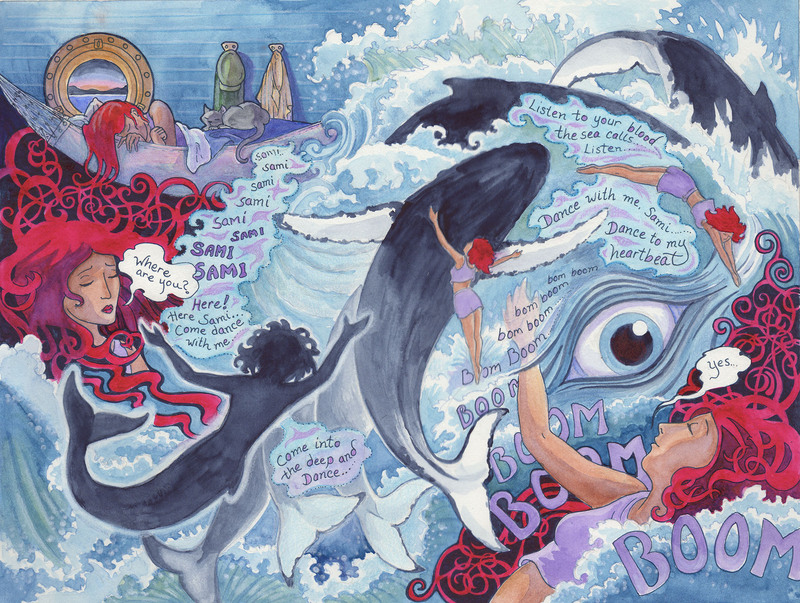 This comic was posted in Mermaid Music and tagged cat, dolphin, dream, fantasy, graphic novel, humpback whale, merfolk, mermaid, mermaid comic, ocean, undersea, watercolour, webcomic, whale.